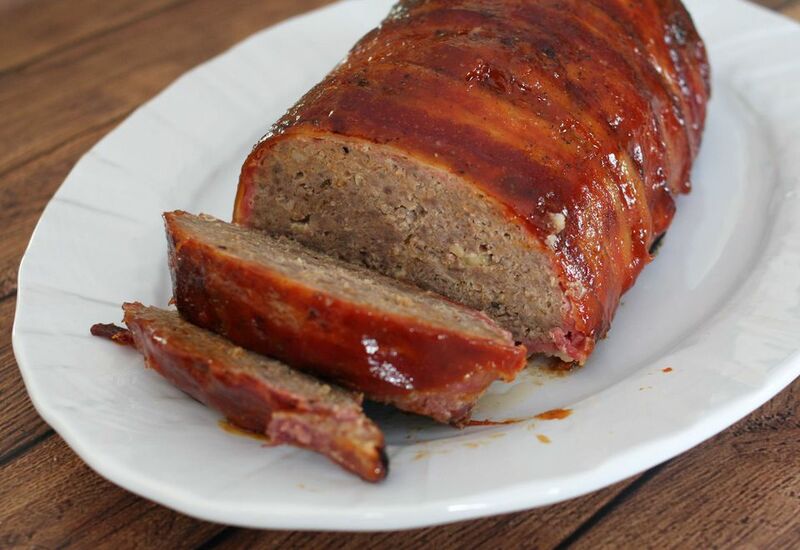 You can use candied brown sugar bacon to coat the meatloaf, or skip the brown sugar and use plain, partially cooked bacon strips. Line a rimmed baking pan with foil; lightly oil the foil or spray with nonstick cooking spray. Cut the bacon strips in half crosswise and coat them with the 2 tablespoons of brown sugar, if using. Arrange the bacon on a foil-lined rimmed baking sheet and bake for 15 to 20 minutes, or until almost crisp. Remove the bacon from the oven and let it cool. In a large bowl, combine the ground beef, pork, onion, bell pepper, breadcrumbs, egg, cheese, Cajun seasonings, Worcestershire sauce, salt and pepper, and the milk. Put the ground meat mixture on the prepared foil-lined baking pan and shape into a loaf. Spread barbecue sauce over the loaf and arrange the bacon strips over the top. Let stand for 10 minutes before slicing or moving to a serving platter. **The minimum safe temperature for ground meat is 160 F (71 C) and the minimum safe temperature for ground poultry is 165 F (74 C).